Enhanced Oil Resources Inc. has released the results of the 2008 Cawley, Gillespie & Associates Inc. reserve report, a reserve evaluation report of the company-owned helium and carbon dioxide reserves within the St. Johns He/CO2 field located in Apache county, Arizona, and Catron county, New Mexico. The company commissioned Cawley, Gillespie & Associates to provide a helium and CO2 reserve report based on standard SPE-PRMS petroleum reserve reporting guidelines incorporating all geological, reservoir and drilling data collected within the field as of July 1, 2008. Standard reserve categories of proved, probable, possible and exploratory, were used and assigned to each drilling location based on the offset location approach. Field-spacing rules dictated that step-out drilling locations be considered on 640-acre spacing. Due to the high probability of future down-spacing, 320-acre drills inside proven 640-acre sections were included in the report as probable reserves. Phase 1 development of the St. Johns dome includes 15 years of helium-rich CO2 production of 350 million cubic feet per day then natural decline thereafter. Additionally, helium-rich areas of the field were targeted maximizing the value of the project. Based on these criteria, Cawley, Gillespie & Associates estimated that 4.2 trillion cubic feet of helium-rich CO2 reserves exist in phase 1 development with 2.3 trillion cubic feet falling in the proved and probable classification of which 1.8 trillion cubic feet is located in proven 640-acre sections of the field. Being CO2 and helium, National Instrument 51-101 does not apply to these reserve calculations and accordingly, these reserves are not required to be categorized under NI 51-101 Canadian securities regulations. Barry Lasker, president and chief executive officer of Enhanced Oil Resources, said: "The results from the Cawley, Gillespie & Associates reserves report has confirmed that the St. Johns dome is capable of producing an initial targeted rate of 350 million cubic feet per day of helium-rich CO2 and that considerable upside remains in the field for future expansions. The company is currently in discussions with potential end-users for the delivery of CO2 into the Permian basin. In this age of high oil prices there is considerable interest in CO2 flooding in mature, depleted oil fields. The company stands ready to develop the St. Johns field in order to capture value associated with CO2 flooding its own oil fields and to supply additional CO2 to other producers in the area." HOUSTON, June 19 /CNW/ - June 19, 2008 - Enhanced Oil Resources, Inc.
build a substantial EOR reserve base in the Permian Basin for CO2 flooding. under Canadian securities regulation as contingent resources under NI51-101. the details of the location of the transaction at this time." production tubing from the hole and to log and cleanout the open hole section. redesigning the down-hole configuration of those wells. could be achieved from our earlier Amos Wash wells." Enhanced Oil Resources, Inc. Announces 37% Increase in Potential CO2 Reserves at St. Johns Helium/Carbon Dioxide Field. resource has considerable deliverability potential. and 26 BCF of Helium. possible recoverable reserves at St. Johns. Permian basin and to supply additional CO2 to other producers in the area." to cash flow. The effective date is May 1, 2008.
the estimated 125 million barrels of original oil in place. reinforces our ability to acquire additional EOR resources in the future." CO(2) field in North America. typically contains statements with words such as "intends," "anticipate,"
list of factors, risks and uncertainties set forth above are not exhaustive. Here are a few previous posts I have made on Enhanced Oil Resources (EOR.v) over the past few months. The workshop didn't give much more then I knew already except a few more junior names, some private companies (possibly going public) and a few interesting trends (ie Microbial Oil Recovery). So as you can see its a pretty small group (might be others?) to pick from and they aren't all using the same technology for Enhanced Oil Recovery. Enhanced Oil Resources Inc. (EOR.V) is a development stage, enhanced oil recovery (EOR), company that controls approximately 235,000 acres of land within the St Johns Helium/CO2 field in Arizona and New Mexico where the Company is developing what is thought to be the largest undeveloped resource of helium and carbon dioxide gases in North America.Independent engineering firms have estimated that the St Johns field contains approximately 15 trillion cubic feet of in place resources, with a potential recoverable resource of 5 trillion cubic feet. Development of the project could result in the Company becoming one of North America's largest Helium and CO2 suppliers and EOR producers. The Company’s helium reserves, once in production, will be sold to Air Liquide under an existing 15 year Take-or-Pay gas contract. The Company’s strategic focus for CO2 delivery and EOR production is the Permian Basin where significant potential exists for enhanced oil recovery from mature, depleted oil fields. So i like them for obvious reasons and most importantly , because they have picked up a couple of these "depleted oil fields" at very good prices and are looking for more acquisitions or earn-in agreements on fields in the Permian Basin. I have a lot more to share, but will do so over the weekend when I have more time, but just wanted to give a heads up here first. - Their Model is based on Kinder Morgan and Danbury who both are $billion market caps. As always DD's first, but something to look at forsure and their presentation will definetly help paint a clearer picture as will I with time. I am still following EOR very closely these days and like the base it has formed TA wise, and their cash position. They have $33Million on hand ($7 million is restricted) after completing their most recent PP and the exercise of some warrants. 140M Fully diluted share count, a market cap of $115million and the plan to be a Billion Dollar market cap company. It might not be a 1 year play, but 2-3 years down the road this stock will be much much higher and from here I think there is still some good short-term upside. When Barry gets into talking about the Department of Energy (DOE) reports and the potential the Permian Basin in New Mexico has and what they are able to pick these properties up for I was mpressed. To date they have spent $4.7 Million to acquire 2 fields in the Permian Basin and plan to pick up more near term. Now because these fields are producing minimal BOE/day (ie 20 & 70 BOE/day) they were able to acquire these fields for $0.10/barrel IF expectations prove as expected, which IMO don't seem unreasonable. Clearly, with their CO2 leverage they are only interested in properties that are producing minimal BOE/day (so they can get them cheap) and properties that are suceptable to CO2 flooding. They can be patient and have many depleted fields in the Permian Basin to choose from. If all goes well, EOR has the potential to control the largest undeveloped filed of naturally occuring Helium ($100/MCF) & CO2 gases in the United States. Not to mention they are closer via pipeline then current major suppliers of CO2 to the Permian Basin. It also gets me thinking about CO2 credits, etc? 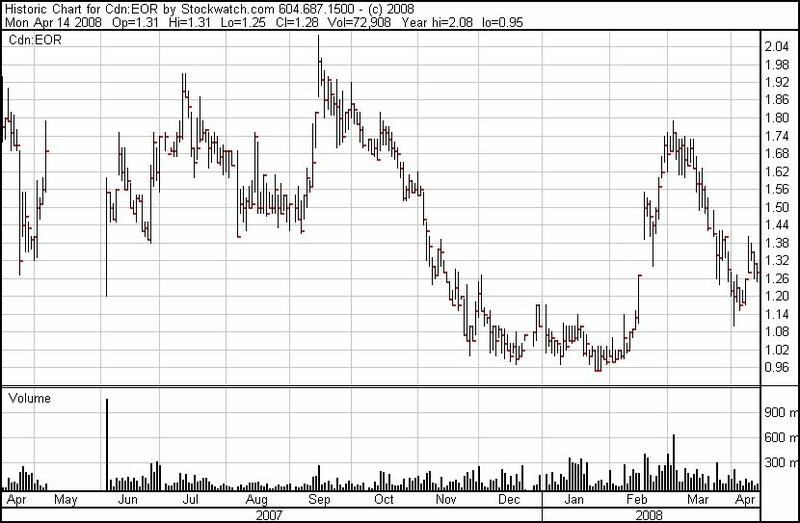 Been following this one for awhile now and EOR.V is trading off its recent highs and is starting to look good again IMO.